> Big Garments Pre-Christmas Sale is from December 15-18, 2011 includes Emporio Armani, Forever 21, Muji, Ny&Co,Old Navy, H&M, G2000, Timberland and Victoria Secret. Big Garments Pre-Christmas Sale is from December 15-18, 2011 includes Emporio Armani, Forever 21, Muji, Ny&Co,Old Navy, H&M, G2000, Timberland and Victoria Secret. 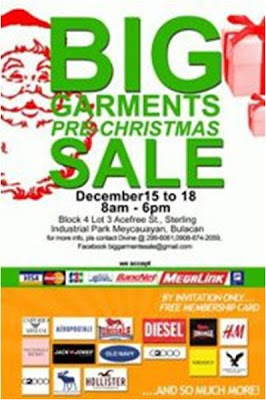 Big Garments Pre-Christmas Sale is from December 15-18, 2011. Sale Hours: 8:00am to 6:00pm. New Arrivals: Emporio Armani, Forever 21, Muji, Ny&Co and Victoria Secret. Other Brands on Sale include Old Navy, H&M, G2000, Timberland & More! For BGS members: Bring a non-BGS member and get P100 voucher. 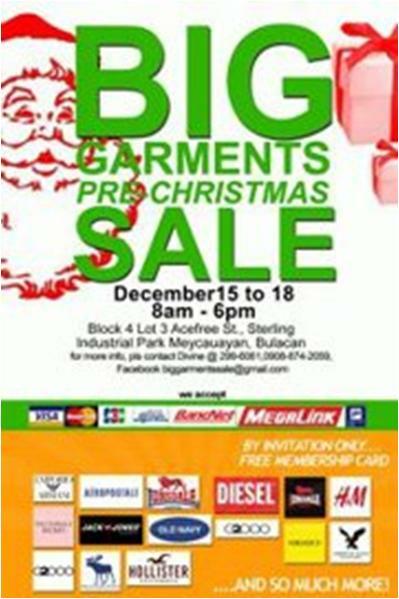 For non-BGS members, please fax or email 2 valid id's at 299-6061 or e-mail it at biggarmentssale@gmail.com. Don't forget to include your mobile number so they could send you a confirmation text invite. All items are original. If you have complaint you can always return the items and they will verify with the factory that supplied it. Cash, G-Cash, Major Credit Cards (Visa, Mastercard and JCB) and Debit or ATM Cards (Visa, Mastercard, Bancnet, Megalink & Expressnet) are accepted. 6. Their gate is color GREEN.